The youngest member of SNSD. Being the only child in her family, she feels thankful to gained eight older sisters through SNSD. Seohyun loves sweet potato so much that she claimed she’d pick sweet potatoes over male. In the make-believe marriage variety show ‘We Got Married’, she was coupled with CN Blue’s Jung Yonghwa and they were given the nickname “Sweet Potato Couple”. Her favorite anime is Keroro Gunsou. Seohyun’s favorite male celebrity is Johnny Depp. She also loves manga / dorama Nodame Cantabile. Her idol is UN’s General Secretary Ban Ki-moon. Seohyun went to the same high-school with Yoona (Daeyeong High School) but then she transferred to Taeyeon’s alma mater, Jeonju Arts High School, and graduated there. Now she’s attending Dongguk University’s Department of Art along with Yoona. 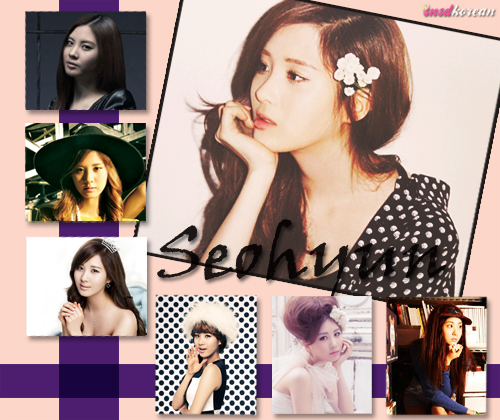 Seohyun plays piano since she was very young, she started to learn guitar during her participation in ‘We Got Married’.